Dry pack mortar is used to repair the concrete surfaces which contains cracks or holes of depth larger than or equal to the least dimension of the repair area. 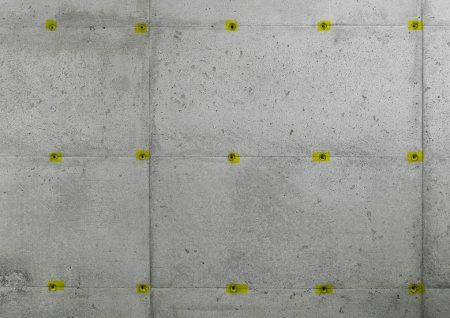 The holes generally found on concrete surfaces are cone bolt holes, she bolt holes, holes created by from ties etc. Dry pack mortar is not suitable for shallow cracks, completely extended holes i.e., from one side to other side, space behind reinforcement etc. 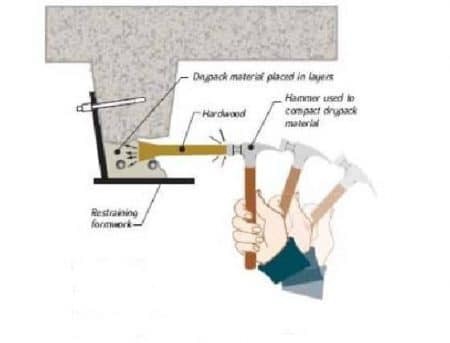 Following are the steps involved in concrete repair work by dry pack method. Before applying dry pack mortar, the surface or hole which needs repair should be properly cleaned, washed and dried. Also they should be free from damaged pieces of aggregates. The inner surface of hole should be rough to develop good bond. If they are smooth, they should be roughened by tapered reamer or star drill. Generally there are three methods are available to prepare the inner surface area of holes for getting strong bond with dry pack mortar. The inner surface of hole is brushed with bonding grout which contains cement and fine sand in the ratio 1:1. Now apply the dry pack mortar before the bonding mortar gets dry up which creates good bond between mortar and surface. 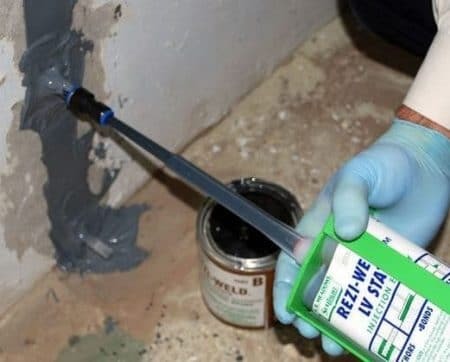 The only thing remember while applying bonding grout is there should be no free surface water in the hole which means the hole should be completely dry. The hole is pre-soaked overnight using wet rags or burlap and allowed to dry. When the hole is partially dried or contains some amount of surface water, then dry cement is sprayed on to the surface using small brush. The cement will absorb free water and forms a layer on the surface. Excess cement which is still in dry form is removed using jet of air and now dry pack can be applied on the surface. In this method, epoxy bond resins are used to create good bond between dry pack mortar and surface. Epoxy resin is mixed and applied on the surface using brush. Make sure that the concrete temperature should not be more while applying epoxy otherwise it may burn or dry up the epoxy quickly. After applying epoxy, immediately apply the dry pack mortar before epoxy becomes dry out. Main advantage of using epoxy bond resin is it prevents hydration of water to surrounding concrete surface. Dry pack mortar is prepared using only cement, fine aggregate and water. In general the mix contains 1 part of cement and 2.5 parts of sand. Low water content is preferred to eliminate excessive shrinkage and to attain high strength. Sand or fine aggregate used shall pass through No.16 (1.19mm) sieve. 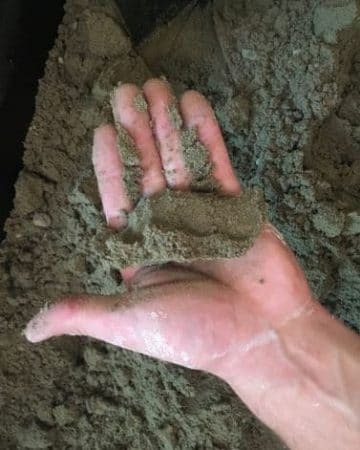 Water in dry pack mortar should be added in such a way that the mixture should form a ball when molded in hand and it should not crumble or slump. Since it contains rich amount of cement, it is usually dark in color which may not match the concrete surface color. However if color uniformity is required white cement can be used. Dry pack mortar should be applied in layers wise with a maximum compacted thickness of 10 mm for each layer. After placing each layer, grooves are provided on the surface to assist strong bond with above layer. Each layer should be immediately applied without any delay otherwise the layer may become harden. The compaction of each layer is obtained by striking the surface with hardwood stick using hammer. Hardwood Stick used is generally 8 to 12 inch long and 1 mm in diameter. While tamping or compacting, stick is generally placed with an angle to compact the sides of hole. Metal rods or usage of water for ease of compaction is not recommended in dry pack method. After initial setting of applied mortar, repaired area is cured with water for a period of 14 days. The mortar should not allowed to dry during this 14-day period. After completion of 14 days water curing, curing compound is coated on the mortar surface. 2 coats of wax base or water emulsified resin base can be used as curing compound. Repaired area should be prevented from freezing temperature for at least 3 days after application of curing compound.